OOH... somebody thinks I'm stylish! 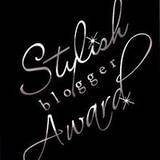 The Stylish Blogger Award was passed to me by The Constant Search for More. I am to share five 'secret' things about me and/or this blog then pass along this award to five stylish bloggers. 1. I like to iron. Just about everything in our house gets ironed except socks. But I hate making the bed (but do it, in fact I can't stand when a bed isn't made, it's a love/ hate relationship). 2. I've had a daily planner since I was 12. My first one was bought at Bloomies Express in JFK airport. It was a cream mockadile. I never let anyone see the lists that are written in there everyday. It's like that scene in A Beautiful Mind where that guy walks into Russell Crowe's room... nobody needs to see the crazy. 3. I'm a little scared of the ocean, not of the water, but of everything that lurks in there that we can't see. Like ghosts of drowned ships and stuff just floating around down there... creepy. Oh, and I'm, not a huge beach fan. I like the idea of the beach (the warmth of the sun, relaxing, blah blah blah) but I don't like crowds, and I hate sand. Hate it. I hate how it sticks to you. 4. It irritates me when people get political on Facebook. Leave Facebook a happy friend place. When I'm having my morning coffee, seeing what's going on with all my long lost around the world friends, I really don't want to read snarky comments about one political person or another. It's not the place. And let me say, I am always up for intelligent political discussion and debate (in person, on the phone, via skype), but these are like ignorant drive by comments, political hit and runs if you will. And there just plain mean! 5. I have a large scar down the middle of my forehead. It kind of looks like Harry Potter's scar except more realistic. When people ask me how I got it, I usually tell them this crazy story about playing Monopoly with my brother when we were little and him freaking out because I got Boardwalk and then sheer Incredible Hulk kind of insanity ensuing. But the truth is, I ran into the corner of the wall when I was two years old (I'm really really clumsy, and really fast). I was at my babysitter's house (can you imagine? babysitter's worst nightmare). My head split open like a melon, right down the middle. I have a ridiculous number of stitches (don't remember the exact number and not going to guesstimate because then I'll get that phone call from my mother). I was very lucky for two reasons, 1) my babysitter was an EMT and 2) a plastic surgeon stitched me up instead of some 1st year resident with shaky hands. I actually remember what I was wearing; a coffee colored turtleneck bodysuit (with snaps underneath) and red corduroys. (Leave me alone, it was 1979. But I wonder if I'm still entitled to the Stylish Award after admitting to that ensemble). Damn! I was going to say something but I've totally forgotten what it was! That premature Alzheimer's is really kicking in! P.S. Were you really only 2 in 1979? Yes Keith, I was 2 in 79. Good lord, how old do you think I am??? Oh - I'm with you on the political facebook stuff. I just hide those people ... and the whiners ... and everyone else that bores me. :P I like to think of it as a happy place too. If it makes you feel better, in 1979 I was wearing "glitter jeans," a satin jacket, and rollerskates that looked like tennis shoes...you betcha. AH! Merci beaucoup missy! Love love love awards! I have it on good authority that your look circa '79 was tres stylish. I too had the coffee colored turtleneck bodysuit (with snaps underneath) and red corduroys when I was TWO in 1979!!! Truth. Like Valerie, I just hide people who get too political on FB. What's worse to me than political drive-bys are the Facebook preachers. I have one friend who apparently became religious since I knew him (he was a Christian yes, but this is much more in-your-face.) The problem is knowing someone well, and knowing their prior record, and then watching them get all judgmental on other people. To the point of not sharing relevant tidbits to his life, like the fact that he has a child who is severely autistic. That was something that instead of gathering his friends together for, swept under the rug in order to preach at everyone. Facebook is not a soapbox. On another topic, I don't have a forehead scar, but I do have a permanent dent. From when I was a toddler and tripped and fell right on to the foot of a rocking chair. I have a big scar in the middle of my forehead too from a small collision with the concrete when I nosedived off of my bicycle. Oops! And I usually never tell people that story. And you already know my obsession with my daily planner (which by the way is still missing). I have to say, I HATE to iron. Actually, I just hate taking out the ironing board and putting it away and I don't like putting water in the iron either. The actual ironing part is not so bad. However, I do not mind making the bed. But yes, the bed MUST be made! Thanks Sara Louise, this is so cool, been thinking about my 5 things all morning! it's the one thing I won't do around the house. Look for a huge, wrinkly package in the mail in the next few days. I love that "nobody gets to see the crazy." I should probably adopt that policy more before I scare off the fiance. And I too have a scar on my forehead...from taking a trip down basement cement steps when I was 3. On my tricycle. Awww!! You're too sweet! I'm sure you could hold down a better conversation in French than I though! Seriously, the thought of conversing in any foreign language creates a wall. A thick, big, wall that makes me clam up. I'm still working on getting over it. Inquiring minds must know, so do you actually iron underwear then?? i LOVE your '79 outfit. so much so, in fact, i plan on dressing my own kids that way all the time. terri cloth jumpers and velour overalls FTW. you officially won my heart over with the hulked out monopoly game. any time someone goes hulkamania, it hits close to home and reminds me of a certain special someone*. I love that I'm not the only one obsessed with planners, haha! Congrats on the award! Sooo .... when you wanna come over?? Ironing is the one chore I abhor. I'd rather clean toilets. Sadly, Mr M loathes ironing too. Now, my stance on ironing is fine, as I only have approximately 2.7 items of clothing that require the press of an iron. M on the otherhand? Every. Bloody. Thing. He. Owns. And his mother keeps sending him lovely pure cotton, requires 20 minutes to iron, shirts. Thanks Mother-in-law! That's super nice of you!! Well, Merci Madame. Since neither my garden nor myself are feeling particularly stylish at the moment, this comes at a much needed time. I am the worst ironer in the world, my clothes look worse when I finish. So others iron for me. I have no day timers I just run over lists in my head obsessively. perhaps i should take a page out of your book so to speak? can't imagine what i haven't already told on myself...would my 3 husbands come as a surprise? I remember those awful body suits. What was up with those anyway? I know exactly what you mean about having the bed made vs. making it!As for drive-by political comments. Just sad. And you strike me as tres stylish, scar or no scar ( and it must be very faint). Yikes!! That story is so scary, I can't imagine if I was your babysitter, but thank goodness you are okay now! And I am right there with you on the ocean... just wish I loved to iron! jeez, poor two year old you. poor baby-sitter! I baby-sit often and I'm always praying that nothing like that would ever happen while I'm on the job. I'm trying to remember the last time I ironed anything...it was before I moved to Boston, and the likelyhood of ironing something in College???? Maybe 2007? I joined your expat group on blogher. Love your sire. I wish I were in France b/c I can speak enough to get by. I remember a lot from high school, except one time while in Strasbourg I told a guy "Je suis toilet". But what I meant to say was..."Je suis allé à la toilette." Which that probably deserves an explanation as well--why I was telling a guy I went to the bathroom. :) Anyway Hallo from Deutschland! Oooof, I post total feminazi articles on FB. I know, I know, I'm very aware...I think it's because my very conservative mother is on my FB, and it tickles me to know she sees them. I'm horrible. I guess this means you won't come over and iron for me?